Building on The Hague Institute’s roundtable panel on Ukraine on 28 May and commentaries on 4 March and 26 February, freelance journalist, David Patrikarakos, provides the following timely analysis of the challenges facing the region after the recent presidential elections. The Ukrainian people’s decision to elect Petro Poroshenko as their country’s new president on 25 May was a decisive and timely call towards achieving two goals: stability and peace. Their determination was reflected in the voter turnout.Despite a wide field of 18 candidates, the elections were only ever a two-horse race between Poroshenko and former Prime Minister, Yulia Tymoshenko. In the end, Ukraine got what it needed: an overwhelming victory as Poroshenko won around 54 percent of the vote to Tymoshenko’s 13.1 percent. Because Poroshenko won more than 50 percent, no second round was needed. Ukraine had decisively elected a new leader (and comprehensively rejected the messianic populism of Tymoshenko); the country could start to move forward – in theory at least. Poroshenko’s clear victory, which gives him a popular mandate (albeit incomplete given that a combination of boycotts and voter intimidation prevented mass voting across parts of the east); the pitiful showing of the far right (thus exposing the falsity of Russian claims that Ukraine is dominated by fascists); and the dismal support for Russian-backed candidates have together undoubtedly brought more consensus and unity into the political mainstream. Poroshenko will be judged most immediately on his ability to restore order to the east – and the government’s response to the Airport siege indicates that he understands the challenge facing him. “The anti-terrorist operation cannot and should not last two or three months. It should and will last hours,” he said on the afternoon of 26 May. He was true to his word – almost. Hours after the airport was stormed, government jet fighters and helicopters launched airstrikes against the separatists and the two sides fought intensely over two days. On the morning of 28 May, the government claimed it had retaken the airport. Spokesmen for so-called Donetsk People’s Republic said that they had lost around 50 fighters in the battle. It was a far cry from the woeful military attempts to clear separatists from their eastern strongholds over the past month. Since then, fighting has intensified between the two sides. The government’s military response is a necessary evil. The state has a duty to bring its east under control, not least for the sake of the large numbers of its citizens there, who live in constant terror of the separatists. But pacification of the region alone is insufficient. Longstanding grievances – economic and social – must be addressed if Ukraine is to have a future as a viable (and a whole) state. The necessary military action must therefore be pursued in conjunction with a sustained governmental outreach campaign to the east. The “communication gap” between central government and the east is the most challenging problem facing the new president. During my travels across this part of the country it became clear to me that the belief that “fascist” Kyiv wants to “destroy” the Russian language and persecute ethnic Russians is pervasive and sincere across the region. The fact that there is no official or even mass popular to desire to either of these things (Russian is so widely spoken across most of Ukraine, even in Kyiv, that it would be impossible to eradicate it even if there was the political will to do so) only illustrates the ‘communicative gap’ that exists between parts of the east and the rest of the country. Poroshenko needs to implement plans for greater decentralization, notably greater devolution of political and economic autonomy as well as measures guaranteeing minority and language rights, as soon as possible. But the government must adequately explain these measures to the local population. As soon as is feasible, local elections must take place to create the emergence of a new local political class able to engage with Kyiv. This process is fraught with difficulties but it remains the only viable measure to create the necessary conditions for dialogue. There is sufficient popular support in the east for a united Ukraine that free and fair elections would yield candidates willing to talk seriously with Kyiv. A program of reforms that adequately tackles wide-scale institutional and political corruption would do much to assuage the local population. The separatists remain a minority (in Donetsk, for example, they number at best a few thousand in a city of one million) and repeated polls have clearly shown a majority of Ukrainians in the east favor a united Ukraine. For these reasons, the situation still remains solvable by Ukraine without external military intervention. But any further escalation of violence could change the situation dramatically. Beyond the problems in the east, wider challenges with significant implications for national stability remain. The spark for the Euromaidan Revolution was former President Viktor Yanukovych’s failure to sign the EU association agreement but the mass unrest was the result of deeper anger at two decades of poor governance and corruption. Ukraine desperately needs drastic reforms across all areas of government, but Poroshenko faces serious challenges. If he is to succeed he will have to remove an entrenched class of corrupt officials across government, the civil service, the judiciary, and law enforcement. Given the scarcity of resources (Ukraine is essentially bankrupt – the recent IMF loan merely postponed default) and the need for quick results certain key areas must be considered a priority. The legal system needs complete overhaul. (In the words of a former ambassador I recently met with: “The courts must become real courts where cases are judged on their merits and verdicts aren’t for sale.”). Officials must prosecute anti-corruption cases vigorously. Corruption amongst law enforcement officials is endemic and must also be tackled. The police force must be completely overhauled: reduced, better equipped and re-staffed (with corrupt officials being removed) – a difficult but vital task. Institutions must be strengthened; in particular, reform of a bloated and corrupt civil service is urgently required. There is also a more general need to redefine Ukraine’s governmental system to create a greater separation of powers between the executive, legislature and judiciary. There remains an overcentralization of power in the Office of the President; a clearer delineation of powers between the Offices of the President and Prime Minister is also necessary to avoid a recurrence of the clashes that have taken place between previous presidents and prime ministers. And the time to achieve all this is limited. Support for the new president is conditional at best. As an oligarch and former minister, he is seen as part of the establishment that created Ukraine’s problems. He is seen as being merely “the best of a bad bunch”.Protestors remain camped out on Independence Square, the scene of the Euromaidan Revolution, refusing to leave until the parliamentary elections in September. Their message is a stark one: we overthrew one president we can do the same again. If Poroshenko fails to quell the east and fails to deliver on his promises to start reforming Ukrainian politics, there is a feeling here that civil society (which was greatly empowered by the revolution) will act once more. Changes need to come quickly and be visible to the people. Ukrainian officials are accordingly clear and vocal on the need for international help. Their requests include greater sanctions on Russia if necessary (these should be preventative not reactive), financial and, if needed military aid – both lethal and non-lethal. Requests for foreign expertise in overhauling institutions are also repeatedly requested. Ukraine now has the opportunity to start to heal itself and to move forward, but much will depend on its relations with external powers. Relations with Russia, which has so far sought to destabilize the country, must be improved. 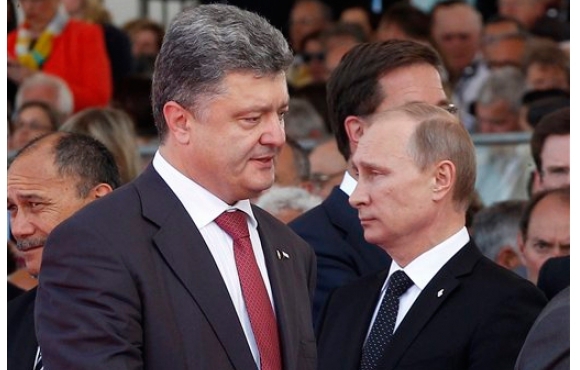 Russian President Vladimir Putin has declared that he is ready to deal with Poroshenko and whilst his pronouncements must be treated with appropriate skepticism, Ukraine’s president must begin serious negotiations with Moscow as a matter of urgency. How much support Ukraine gets from its European and North American partners will also be critical. So far, they have promised much but delivered far, far too little. David Patrikarakos is a British journalist and the author of ‘Nuclear Iran: The Birth of an Atomic State’. He is a Poynter Fellow at Yale and an Associate Fellow at the School of Iranian Studies at the University of St Andrews. He has worked with governments and think tanks on a variety of policy-related issues.